Reflect an elegant style in your living room or foyer decor while adding versatile storage and function with this sofa table. The large shelf at the base of the table can be used for decorative pieces and other items. The traditional style of the table includes scrolled posts, a shaped table top with banded veneer, and scrolled metal accents to make a grand impression. 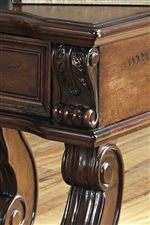 The Alymere Traditional Sofa Table with 1 Shelf by Signature Design by Ashley at Beck's Furniture in the Sacramento, Rancho Cordova, Roseville, California area. Product availability may vary. Contact us for the most current availability on this product. 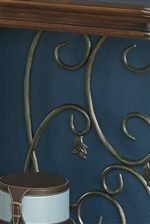 Case Detail The ornamental wrought and cast metallic looking elements are accented with a vintage burnished gun metal finish. 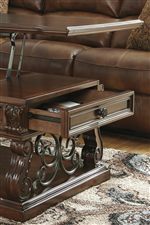 The Old World style and function of the Alymere collection tables present beautiful options for your living room. Featuring construction using select birch veneers and hardwood solids in a vintage brown finish, the scrolled posts and shaped table tops of the tables will enchant you with their traditional design. The Alymere collection is a great option if you are looking for Traditional furniture in the Sacramento, Rancho Cordova, Roseville, California area. Browse other items in the Alymere collection from Beck's Furniture in the Sacramento, Rancho Cordova, Roseville, California area.